Travel is one of my favorite topics. I love to talk about traveling, sit on the computer and plan dream trips and take actual trips. Sometimes I think I should have been a travel agent because I enjoy it so much. I always love to help friends and family with their travel questions from what I have learned. 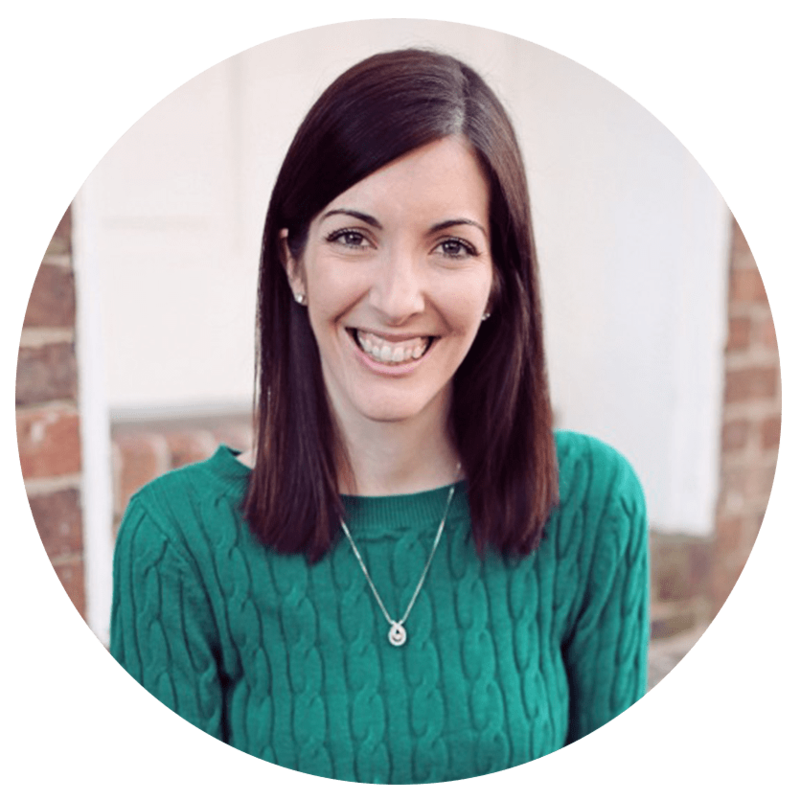 Today I wanted to share with you some Tips on How to Priceline. 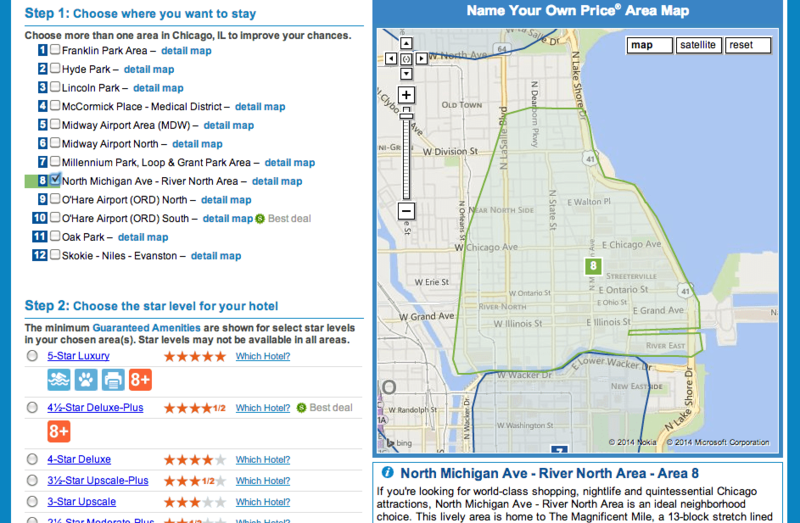 I love using Priceline as a great tool to get fabulous deals on hotel rooms. This fall we have three (hopefully) little weekend trips happening and I’m really excited to get to see some new cities. But traveling is not cheap. Fortunately these are all destinations within a few hours so we are able to drive but hotel rooms can be so expensive, am I right? My dad was the one to show me how to figure out Priceline and I wanted to share with you what I have learned. I’m a planner, so I’m not just going to go into Priceline and just go for it. I need to research and know which hotels I could be getting before I start bidding. Be aware that once you bid on a hotel within a certain area and star range that if you get it you’re locked into the hotel and you won’t know the exact hotel until after winning it. But these are a few tips to help you narrow down and evaluate your options. 1. Enter the City and Dates: I’m going to use a city I love for my example, Chicago. We went there over the 4th of July and loved it! You can read about that trip here. The first step of course is to put in your city of choice and the dates you want to visit. 2. Visit the “Name Your Own Price” page. On this page you have a map view showing all of the different areas. This is where you have to pay attention and pick out the area where you want to stay. 3. 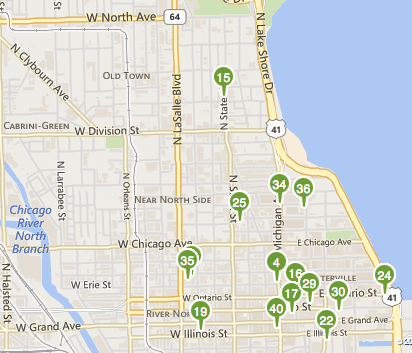 Pick Your Area and Note the Boundaries I’m picking North Michigan Avenue-River North area. I then want to zoom in on the map and take careful note of the parameters of this area. You can see this is a tricky one because it’s right on the border with another area. You will want to take note of it, maybe even capture it on your phone to refer to because the next part involves finding the hotels in that parameter. 4. 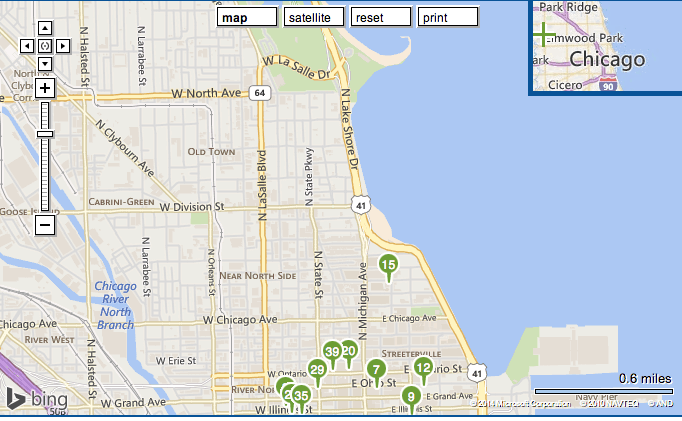 Return to the “List View” and choose “Map View” Find your area and begin looking at the hotels there. If you already know you want a certain star rating then go ahead and narrow it down. You may want to check out the options in a multiple number of star choices. I picked 4 and 3 star hotels. So you zoom into the spot on the map that you’ve chosen and start going through the different hotels. What you’re looking for is any bad ones within those star choices because more than likely you end up with the outlier hotel. For example when you look at the map you can see most of the hotels are really close together and close to the Riverwalk area. But you see one 4 Star hotel that is way up at the top of the parameter. That would be #15 on the map. So if you go into bid on 4 star hotels you may get this one which is going to be a much farther walk to the main attractions. Because of this you may want to eliminate 4 star from your search. 5. Narrow Down Your Search. Here is what is in our parameters with a 3 star search. 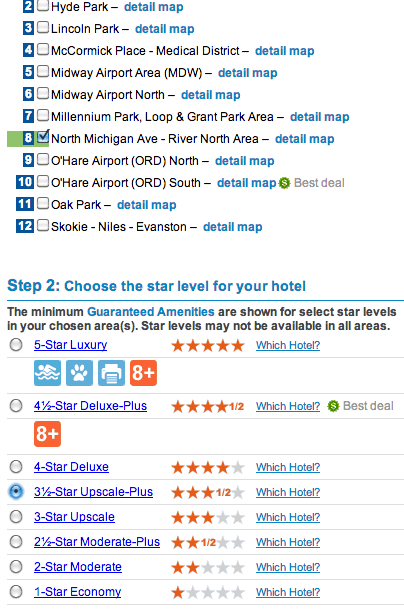 Keep in mind that these are 3 and 3 1/2 star hotels and that you can bid on either. So when you are looking be sure to distinguish between the 3 and 3 1/2 stars because you will bid on one or the other. 6. Review the Hotels. From this point I would just begin to look at all of the hotels, check the reviews and look for any ones that pop out as worse than the other hotels. If something sticks out then I want to avoid bidding on hotels in that star class if it’s a deal breaker for me. Because once you bid and win it’s yours. No take backs. 7. Go to the “Name Your Own Price” tab Once I’ve picked what I want to bid on I will go to the “Name Your Own Price” tab. I select my area and the star class that I want to bid on. 8. Start Bidding! It will show you a median retail price. When I’m bidding I like to set in my mind the highest I’m willing to go. I then start early before our trip and start as low as I want. You can only bid on your specifications once every 24 hours. So I like to give myself time to work my way up because I hate to just go in with my highest amount and wonder could I have gotten any lower? Sometimes it might be a last minute trip so that might be the best plan. It all depends on your trip and your preferences. This is how I Priceline. I’m sure everyone has their own way of doing it but I love the in-depth, researched way. It’s also a bit easier when it’s a smaller city and you have less hotels to sort through and less areas to choose from. Do you have any tips or tricks for getting good deals for travel? Disclosure: I am not being compensated for this post these are just my opinions. I am by no means an expert, just sharing what I have learned from my experience. Wow! Fabulous tips! I’ve used Priceline before but never to book hotels like this. I’m going to have to try that for my next trip! Hope you get good results! I’ve never used priceline, but it looks quite interesting! It is great for trip planning! 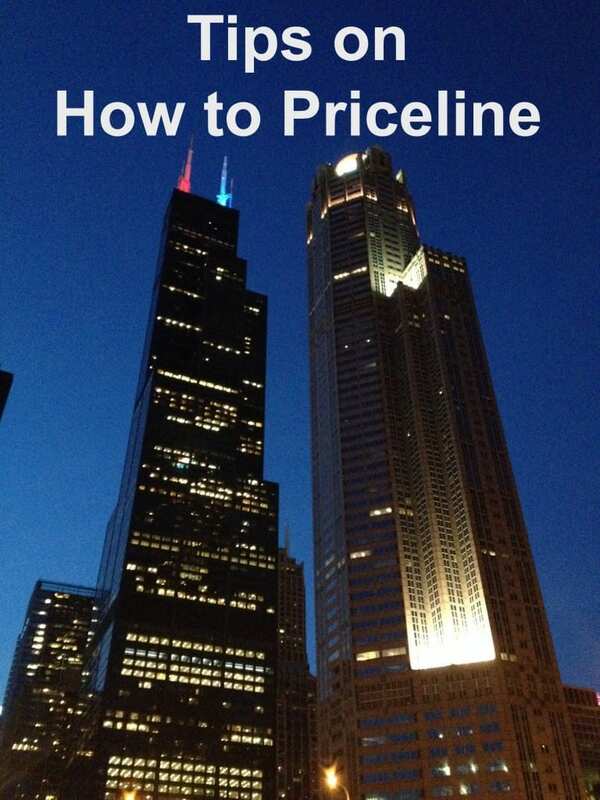 I booked a trip to Chicago on Priceline! The only time I’ve used it, I was pleased! It can be such a great resource for trip planning! OMG these are great! I always feel like I am getting screwed on these sites! Thanks for the tips! I love priceline. 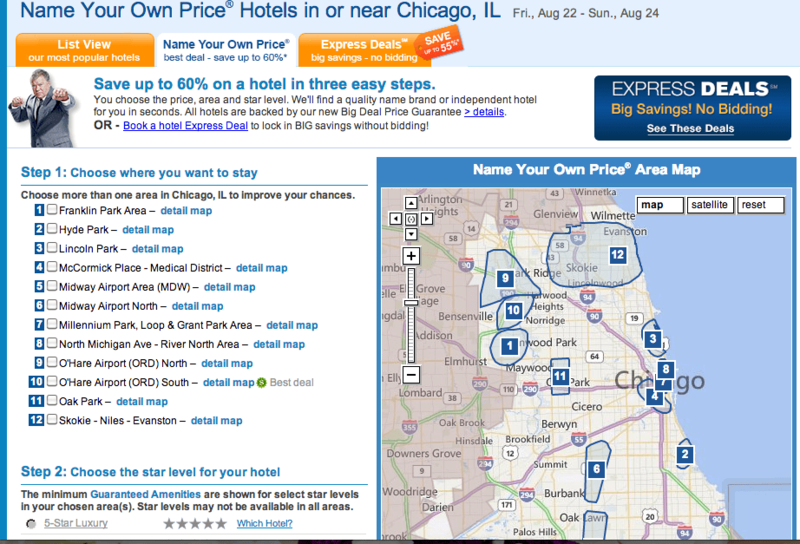 Before I started doing more specific hotel promotions we would use priceline a lot to save some cash. Great post! Excellent ideas! I use priceline a lot, and I have 3 different computers in the house, so I am able to bid 3 different times in 24 hours….one little extra tip! I also blog about my travels and hope you will stop by for a peek! What a smart idea! Hopping over to your blog now! You and I are a kindred spirit. I love planning trips as well and have used Priceline in the process. It’s so much fun and I love getting the great deals!